label.m Honey and Oat Treatment Mask is a lightweight mask to leave hair sleek, soft and radiant. Specially formulated with an exclusive Hydra-5 complex to rehydrate parched hair, restoring vitality and revealing healthy-looking locks, whilst protecting fibres from damage caused by heat styling and chemical processes. Antioxidant-rich Royal Black and Lehua Honey replenish locks and transform lack-lustre hair, whilst Oat Extract and Baobab Oil target dry, brittle strands to prevent breakage and split ends. 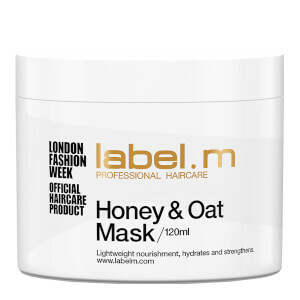 Suitable for use every three to four washes, the mask treats hair from root to tip so you can experience nourished, moisturised and replenished locks with a luscious fragrance. E.N.